« The Z-Meter: Your Votes are In! When our little cabal of writers gets on gmail and starts talking about what each of us will contribute each week, lots of ideas get thrown out. When the idea of interviewing Elizabeth Martin came up, there was serious concern that none of us was smart enough to hold our own during a Q&A. I’ve never let the possibility of sounding stupid come between me and a good interview before, so I happily took the assignment. Good choice. 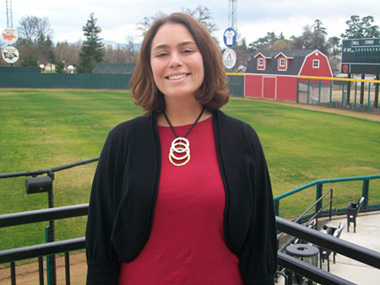 Liz Martin is the Assistant GM and Legal Counsel for the Visalia Rawhide, the A+ California League affiliate of the Arizona Diamondbacks. During our phone interview, she was engaging and funny, and used small words to explain why she chose to use her DePaul law degree in baseball instead of some swanky glass skyscraper. Clearly, she knew what caliber of website she was dealing with. Tell me a little about how you ended up working for the Visalia Rawhide. I actually interned with the team in 2006 when they were the Oaks. It was one of my first internships while I was in law school. I got to be pretty good friends with the owner and stayed in touch with him while I was in school, and he offered me the position when I graduated. You traveled from Chicago to California for the internship? I did. I spent every summer that I was in law school away from Chicago, which is the wrong time to leave town. So the first summer I was in St. Petersburg, second summer I came here and third summer I went to Berkley and worked for the Raiders. Then I came back here permanently. So, while you were in law school, you were targeting a job in sports? Well, when I first went to law school, I wanted to be an agent. It took me about six weeks to figure out that I didn’t want to be an agent any more. Really, what sealed the deal for me was getting the internship with Minor League Baseball and working in their headquarters in St. Petersburg. Working in that kind of organization, I realized that was much more to my taste. I really felt at home. So I shifted directions and went the corporate law route with a sports focus. You are the legal counsel for the Visalia Rawhide. What are some of the legal issues that come up that we might not be aware of? Other than contracts, which is what I do a lot of – sponsorship contracts – I helped with the lease negotiations with the new stadium being built – well, it’s mostly renovations, but it feels like it’s new. One thing that we had happen recently is that an East Coast independent league team tried to take our Mudville logo, which our team also owns. They tried to modify it, but they had clearly taken it and barely changed it and tried to use it themselves. So, logo protection, trademark protection… you’d be surprised how often someone tries to take a trademark and run with it. Minor league teams often change affiliations. Would you have a role in that process if it happens? That’s usually handled by our owner, though I’d definitely help out with that. Minor League Baseball standardizes most of those agreements. Our relationship with the Diamondbacks has been pretty solid, so I don’t foresee anything like that happening. How does sports law practice differ from, say, corporate law? It’s really just the subjects you touch on. I tell people I could work the same crazy hours I work for baseball, but be forced to wear a suit in some underground dungeon, but I get to come to work at a baseball stadium every day. That’s the first bonus. Do you get a chance to join the crowd and enjoy the game from time to time? Definitely, during the games I try and get out of the office and interact. I don’t think many minor league baseball people stay in an office on gameday. There’s always something breaking or a lost child or something that needs attention. For me, it’s a more fun environment. I get to interact with the fans and help younger people coming into baseball. I’m about five to seven years older than anyone else in the office other than our owner, so helping them get their careers off the ground, shape their futures and figure out where they want to go in baseball or in life. Some people come here for six months and say “OK, I never want to do that again,” but I think that’s a great learning process that I didn’t get to go through at 20 years old. As assistant GM, do you have other duties outside the legal realm? I do. I’m also the sales manager because I came from a sales background before I went back to law school. I handle all the HR functions because there are a few legal aspects in that. Fortunately, or unfortunately for the crowd here, I also manage the concession stand. I’m a vegetarian. That would be tough in that environment. Were you involved with baseball as a kid? Not other than just loving the sport. My dad was a baseball player and he got me to fall in love with the sport. I tried to play softball, but I had no talent for that at all. So I became the official scorekeeper, so I learned a different aspect of the sport from an early age. You said your dad was a ballplayer. Did he play professionally? He played in college for a couple of years, at Kent State in Ohio. He played in high school. He didn’t have any sons, and I was the oldest of three girls, so I was the one he would play catch with in the backyard. That’s how we bonded. What is the major focus of your job during the offseason? Preparing for the next season. We get the question a lot. People think in the offseason we take six months off. We’re meeting with sponsors and getting our sales cycle going. It’s basically an event-planning job. But we’re essentially planning 70 separate events. I like to look at them as separate events because each game might have a different sponsor or promotion tied to it. And some people in town only come to one game a year, so we try to make each experience as memorable and special for that person, as for somebody who comes to all 70 games. We kept track of Collin Cowgill from afar when he played for Visalia. Is he a fan favorite there? He was, but unfortunately he got hurt pretty early on and they took him away for rehab. But his name was definitely a tie-in for us being in the cow capital of the universe. I actually didn’t know where the Rawhide name came from. We are in the dairy capital of the world here. The Happy California Cows commercials are basically about this area. We wanted to pay homage to that, and the fact that baseball has been in this town for over 60 years. But we didn’t want to be too cheeky about it, either. We threw around some childish names, but we wanted to be a bit more serious. We gave the players a bunch of suggestions we had received and kind of left it up to them to decide. Rawhide sounds a bit more dangerous than something cow related. Yeah. Like the Moo or the Tippers. Is there some personal pride when someone who passed through Visalia moves up the ladder? We definitely love it. That can be front office or on the field. It’s great to see people who are now in the big leagues who were nice guys when they were here. When I was here in ’06 we were a Tampa Bay affiliate, so I got to spend some time with Evan Longoria and Reid Brignac, so that was fun. That’s just a great story to tell your kids some day. But in the front office, we have a ops manager who is now with the Durham Bulls and one that went to Tacoma. So that’s fun for us to see them move on and have other opportunities, too. How do you know somebody has the right makeup to succeed in a minor league baseball front office? My boss at the Raiders told me if you want to work in sports you have to be just a little bit insane. I believe that. You have to be willing to lose yourself in it; to give everything you have. It’s not a 9-to-5 job by any stretch. At this point we’re working seven days a week. I was here until 9:00 last night and started before 9:00 this morning. You really have to be willing to go above and beyond what most people just coming out of school have ever done. Really Nice post thanks and Join independent summer baseball leagues in North, Central and South Florida to play Spring, Summer, Fall or Winter Baseball. Really Nice post thanks and Join independent south florida baseball in North, Central and South Florida to play Spring, Summer, Fall or Winter Baseball. Did you publish this article all by yourself?